My wife came down stairs after a nap and spotted this Spinach and Strawberry Salad with Grilled Lemon Chicken just as soon as I was done photographing at and just starred at it haha. She was like, “what is that and can I eat it? !” After a few bites she said with her mouth completely full, “this is what I want to eat every day of my life.” I just laughed, but she’s right this Spinach and Strawberry Salad with Grilled Lemon Chicken is dang delicious!! If you’ve been following me for a bit you know I am all about flavor balance, so when I can get just about every profile your palette can handle in one bite then I’ve done my job. The sliced chicken that goes on top was marinating in a very simple lemon-white balsamic vinegar dressing for 4 hours. I know that’s a bit of time, but the flavor that comes from it is incredible. If you don’t want to marinate it and want to grill it asap, fine I won’t stop you but can’t guarantee all the flavor combos will be there. Also, keep that vinegar out because we’re going to use it later. While the chicken is marinating this is perfect time to prepare everything else in this dish. Because I am loving whole grains in my salads and for some more protein I cooked and added in Bob’s Red Mill Quinoa. 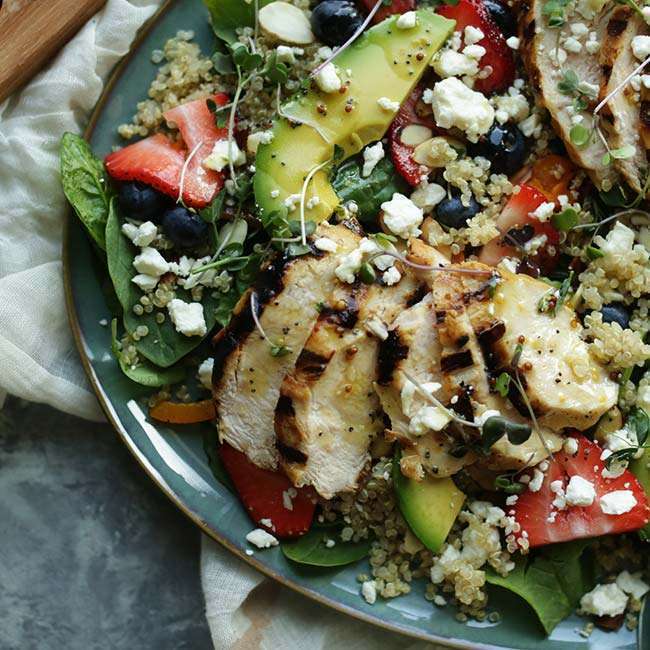 Quinoa is gluten free, so is this salad, and is absolutely packed with nutrients and protein. In fact, it’s considered a complete protein due to providing all the essential amino acids. In other words, see you later steak and hello quinoa!! In addition to the greens and cooked and cooled quinoa I wanted to add in some fresh berries, toasted sliced almonds, roasted bell peppers and sliced avocado. You can toast the almonds on a sheet tray in the oven or in a sauté pan, I did the later over low heat and it worked great! For the peppers I pulled a card out from culinary school and roasted them right on my burner over high heat. If you aren’t comfortable doing this I get it, roast them in the oven on high heat or over the grill. Once they are charred on the outside put them in a big and seal them up for a few moments. This will help the char peel off with ease. Pull that vinegar back out because we are going to make a really tasty vinaigrette. It’s incredibly easy to make and bursting with flavor. It consists of white balsamic vinegar, grainy mustard, olive oil, honey, poppy seeds and fresh thyme leaves. Whisk it together, season it with salt and pepper and set it aside. At this time everything for the salad is done and now it’s time to grill the chicken. You can either grill it over the open flame or in a grill pan. I went with the grill pan because I’ve been really into searing protein lately and I just wanted to do it!! I know I know this final picture of this Spinach and Strawberry Salad with Grilled Lemon Chicken looks crazy and intricate, but really I just spread all of the ingredients all over a platter and drizzled on the vinaigrette. I used both feta and goat cheese, but you can feel free to just use 1. Definitely make this while all of these tasty ingredients are in season, and maybe I’ll come back in the fall with some in season updated produce! Looking for a delicious salad recipe? Try this Spinach and Strawberry Salad with Grilled Lemon Chicken that is sure to satisfy! Chicken: In a large bowl whisk together the lemon juice, shallot, garlic, vinegar, mustard, sugar, olive oil, salt and pepper until combined and submerge the chicken breasts and marinate for 4 hours. Once it’s done marinating remove the chicken and grill it over high heat on for 5 to 6 minutes on each side or until cooked throughout. Slice and set aside. Vinaigrette: Whisk together all of the ingredients in a medium size bowl until completely combined. To Plate: Simply combine all of the salad ingredients together and place on a platter. Next place the sliced chicken over the top and drizzle on the vinaigrette.